3 day trip up the DC following the recent storm cycle. Route is still in great shape! Paradise to Camp Muir: Snow has melted out around Paradise. Winter route up to Panorama Point is just about out of shape. Was able to skin up around Pebble Creek with only a short carry at one point. 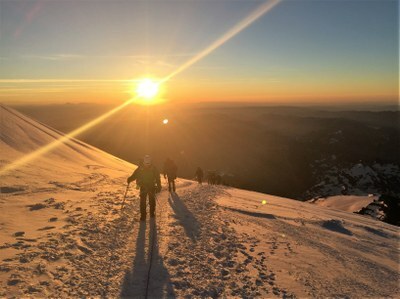 Camp Muir to the Flats: Well-wanded bootpath leads you across the Cowlitz to Cathedral Gap. The Gap is snow free at this point, with a switch back faint trail leading up. After cresting over the Gap, the route goes left and stays high on the rocks for a bit before you drop onto the Ingram. Flats to the top of the DC: After leaving the Flats, the route weaves and crosses 2 large crevasses on snow bridges. They were solid bridges at this point, but probe and be cautious with all the heat we're going to get soon. The DC is about half snow free with a few wands here and there to help out route finding. DC to summit crater: The route is still fairly direct, but has started to end run a few crevasses a bit more from earlier this month. You start to traverse after the DC and will come across a plug over a large crevasse. The guides placed several snow anchors to use for running belays across this point, as well as around several exposed sections above some large cracks. A ladder is pre-positioned with some 2x4s around a crevasse at about 13000 ft, but was not yet in use. Everyone is jumping the crevasse at this point, but expect the ladder to go in soon. Further up around 13500, the bergschrund is opening up and the route goes over a snow bridge, which is starting to look weak. There will be a long end run when this falls out, so expect the route to change a bit soon. Above the schrund, the route weaves around 2 more crevasses, but is fairly direct to the summit crater. Went up with a rather big group of friends for a 3 day trip on the DC. We got a late start on Sunday and registration was a pain - record setting crowds up on the mountain this past weekend! After securing our permits, we made our way up to Muir and set up camp in the lower section. We got a leisurely start to Monday and then reviewed a lot of skills for some of the newer climbers in the group. After checking with the climbing rangers about the forecast, we packed, prepped equipment, cooked, and then went to sleep at 6pm. Plan was to leave at midnight, when the thunderstorm was supposed to clear. The anticipated thunderstorm never developed, and we woke up to clear skies and calm winds. Perfect. After roping up, we moved quickly to Cathedral Gap and then took a break at the Flats. From the flats to the top of the DC, there were a few other parties, so we kept our distance and stayed vigilant for rock fall. Above the DC, we followed the boot pack here and there, and blazed a few new trails every now and then while passing or letting others pass. Temps dropped a bit and it got cold, but the winds weren't too bad. After reaching the summit crater, we dropped packs, unroped, and hiked over to the true summit. Clear skies and a sunny morning on the mountain made for some great photos. SIgned the register and returned via the same route. We descended while it was still early-ish in the morning - this made for a little bit more solid snow and easier travel. Overall, great trip! Muir to Paradise: I skied down :) Group took about 2.5-3 hrs. Summit push timeline: 6pm bed down. 11pm wake up. 12am depart Muir. 9:30am return Muir.